As Japan is famous for its rich and wonderful food culture, many foreigners coming to Japan cannot wait to be able to have a memorable food tour when visiting this country. Unfortunately the varieties of Japanese delicacies available for Muslims in Japan are quite limited due to the ingredients containing either pork or alcohol, which are forbidden for Muslims. 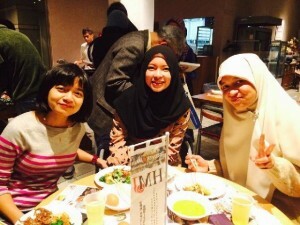 Due to the increasing numbers of foreigners coming to Japan, including Muslims, Japanese people start to show their concern in ‘halal’ concept in order to have Muslims being able to enjoy the Japanese ‘Omotenashi’ as well. Thanks to Kappou Yama Restaurant who is presenting a Muslim-friendly traditional Japanese cuisine party, many Muslims had a chance to try some traditional Japanese taste we have been craving for so long. 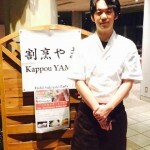 Located in Saitama area, the restaurant can be reached by walking for around 10 minutes from Yono-hommachi station. Our lovely dinner that night was a buffet style, opened with a set of Sukiyaki, Salad, sautéed Tofu and Kinpira Gobou. There were also some packs of ‘sweet potatoes’ in the table. 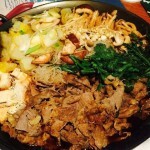 Sukiyaki, one of the most popular Japanese comfort food, consists of thinly sliced beef simmered with vegetables and served in nabemono or hot-pot style. 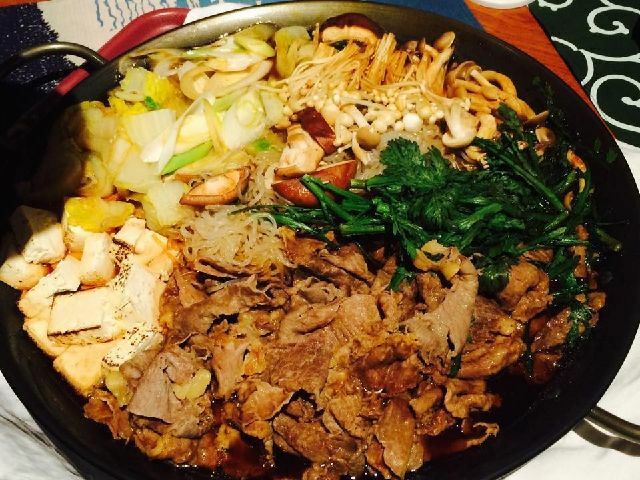 The Sukiyaki was all made with Indonesian-MUI Halal certified Australian beef, Japanese fresh vegetables, and using definitely no-pork and no-alcohol seasoning and ingredients. 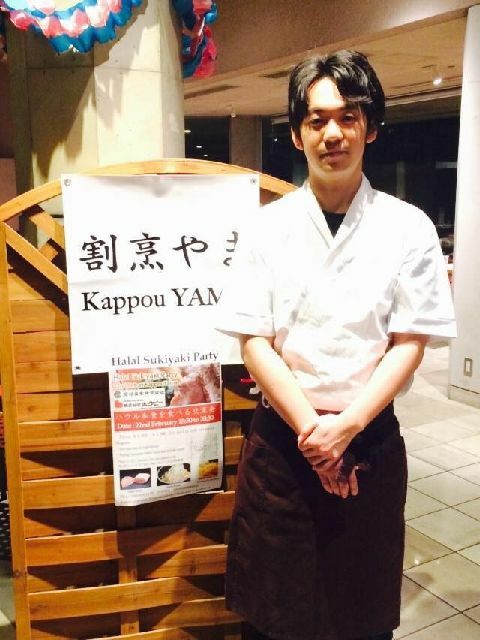 In addition to the ‘Muslim-friendly-ingredients’, the ingredients used were the high-quality ones and the meal was prepared by an experienced Chef in Japanese cuisine! There is no doubt that it has a real authentic taste of Sukiyaki that Japanese people (and the foreigners as well) love so much! The Japanese people showed us how they usually eat Sukiyaki by lightly dipping it to a raw, beaten egg. Although this style of serving might not be so popular among foreigners, raw eggs are actually believed to enrich the taste of meat in Sukiyaki. We were so nervous to try it at the beginning, but we turned to simply love it! Just right after we finished our first meal, the next main course was ready to be served at our table. Chicken-based Soup Ramen noodle was the second menu that night and it looked so tempting as well. Ramen!! We have never dreamed to be able to eat Ramen!! Japanese ramen soup is usually made out of pork-broth, so it is very amazing that we finally are able to have the Halal ramen. It was served with a slice of soft-boiled egg and a round slice of duck meat on top, which makes it look very similar to typical Japanese Tonkotsu ramen (sliced meat from pork). 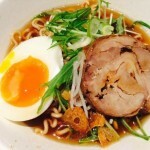 The light and savory taste of the ramen soup is made from chicken and duck broth. 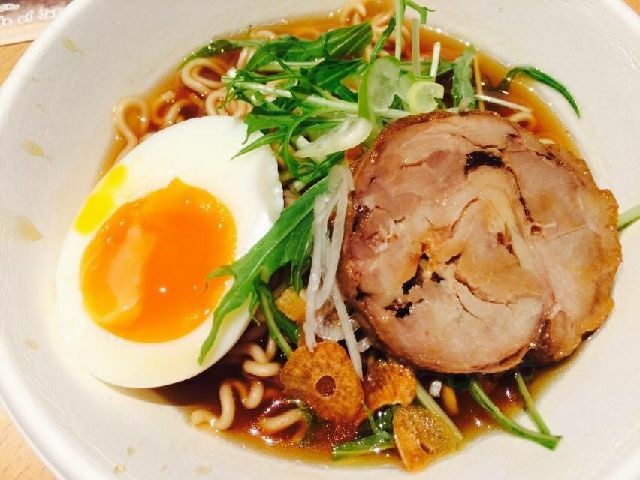 It creates a perfect combination with the original chewy ramen noodle made from mixture of Soba (buckwheat) flour, making it healthier since it is rich in fiber. Thank you for the fun night!! We can’t wait to try some other menu very soon!